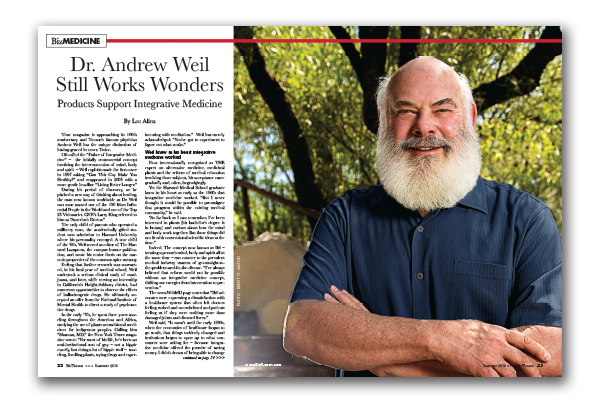 Time magazine is approaching its 100th anniversary and Tucson’s famous physician Andrew Weil has the unique distinction of having graced its cover. Twice. The only child of parents who operated a millinery store, the academically gifted student won admission to Harvard University where his personality emerged. A true child of the ’60s, Weil served as editor of The Harvard Lampoon, the campus humor publication, and wrote his senior thesis on the narcotic properties of the common spice nutmeg. Feeling that further research was warranted, in his final year of medical school, Weil undertook a serious clinical study of marijuana, and later, while serving an internship in California’s Haight-Ashbury district, had numerous opportunities to observe the effects of hallucinogenic drugs. He ultimately accepted an offer from the National Institute of Mental Health to direct a study of psychoactive drugs. Now internationally recognized as THE expert on alternative medicine, medicinal plants and the reform of medical education involving those subjects, his acceptance came gradually and, often, begrudgingly. Yet the Harvard Medical School graduate knew in his heart as early as the 1960s that integrative medicine worked. “But I never thought it would be possible to promulgate that program within the existing medical community,” he said. Listed with Weil among the Top 100 practitioners of alternative medicine are other readily recognizable names like Deepak Chopra and Mehmet Oz. Weil has surrounded himself with quality co-workers who oversee all of the tentacles of a very large business octopus he has built to help fund the IM center and his nonprofit Weil Foundation. “We’ve given away more than $5 million over the last decade and supported some very strategic things that have had big payoffs,” he said with pride. Not exactly. That part of the empire is phenomenally healthy now, coordinated and supervised by Richard Baxter, Weil’s business partner since 1994. He said, “I inherited a decentralized organization and began the process of formalizing our business diversification. After-cost product sales revenue and licensing royalties from Weil Lifestyles are donated to finance the legacy of the center (which did close for a short time in the late 1990s because of a lack of funding and a hefty deficit). By his own admission, Weil is a true Gemini who can appear comfortable in the spotlight as needed, but he doesn’t seek stardom. “Although it’s not readily apparent because of numerous speaking engagements and public appearances, I’m basically an introvert, shy by nature,” he said. A few projects? That would depend on how you define “a few” and if you allow those “few” to be gigantic in scope. In a 2009 BizTucson interview with Weil, reporter Jane Erikson wrote, “The Weil brand was born, not of greed, but of necessity.” Ergo, a need that had to be fulfilled. If you’re the one who conceptualized and brought forth a new approach to healthcare, you must do what you’ve got to do to raise funds to ensure the success of that mission. And how. In the more books/more money category, the New York Times best-selling author is currently at work on “Mind Over Meds,” his latest editorial undertaking focusing on our overmedicated society. Weil continues as editorial director of the popular website, DrWeil.com. He is the founder and co-chairman of Healthy Lifestyle Brands and the founder and co-owner of a growing chain of True Food Kitchen restaurants. In the restaurant world, Valley entrepreneur and former Tucsonan Sam Fox has a reputation comparable to Weil’s as a nutritionist. After the two spent time together cooking in the doctor’s Tucson kitchen, they agreed that healthy food could be delicious. The two have now worked together to build 12 eateries to date. The menus feature dishes influenced by Mediterranean and Asian cuisine, the two healthiest food cultures in the world, with entrees that tend to adhere to the principles of the Dr. Weil anti-inflammatory diet. Other entities licensed by Weil Lifestyle range from skincare products, customized vitamins, pet food and footwear with after-tax profits donated to his many cause-based crusades. Internet researching of his myriad enterprises leads one down the informational rabbit hole It’s a biblical experience with one enterprise begetting another and all headed in the same health-focused direction. Log on to www.drweilproducts.com and prepare to be overwhelmed at the variety of items designed to help promote a healthy lifestyle – from nutritional foods to kitchenware to personal care products. Weil and partner Origins Natural Resources (one of the Estee Lauder Companies) have worked together for over a decade now on a collection of proactive skincare treatments that combine therapeutic plants and herbs with wellness and lifestyle techniques. In developing natural cosmetics like Plantidote Mega-Mushroom Face Serum, Weil relied on his past travels. “In East Asian medicine, a lot of mushrooms are used for their anti-inflammatory effects and the root of a lot of skin problems is inflammation.” Bingo! Attesting to product success and good marketing, the Dr. Weil Origins line is now available in more than 15 key global markets, 100 of its own free-standing retail stores, and more than 400 department and specialty stores throughout the U.S.
Building the Weil World Empire came with a cost however. His former wife Sabine Kremp, mother of their daughter, Diana, had enough after eight years of being Number Two after his work. “The empire killed the marriage,” she’s said. An amazing trajectory of social change and success for a man who decided 40 years ago that it was an omen when his car broke down here and he decided to stay and make Tucson his home.